Menlo Park Family Dentistry offers state-of-the-art services for accurate and long-lasting placement of dental implants. Our dentist, Dr. Richard S. Durando, provides treatment that utilizes the most modern technology available. Dental implants restore function and beauty that patients never thought possible and are changing the quality of people's lives. Implants are not just a cosmetic solution to tooth loss; they also maintain jaw bone health by providing a replacement of the entire root and crown. When the jaw bone does not receive the stimulus that tooth roots and chewing provide, it begins to atrophy in a condition called resorption. Bone loss can cause problems for other teeth, and it also can change a person's facial structure. Before beginning any treatment, Dr. Durando knows it is very important to explore any existing tooth pain and discover why it is happening. Understanding the cause allows us to recommend the most appropriate treatment option, and to educate our patients in the complete process. Having all the information is key to successful planning and treatment of dental implants and helps create a positive and effective outcome. Dr. Durando works with you to develop your complete treatment plant, from placing your implant to adding your restoration. The implant consists of a titanium post that bonds when placed in the jawbone through a process called osseointegration. This allows the implant to serve as an artificial tooth root, stimulating the bone and encouraging its continued growth and development. After placement is complete, it will take a few months for the implant post to become fully fused to the jawbone. Dr. Durando will monitor your healing during this period, ensuring the treatment is effective and that you remain comfortable. 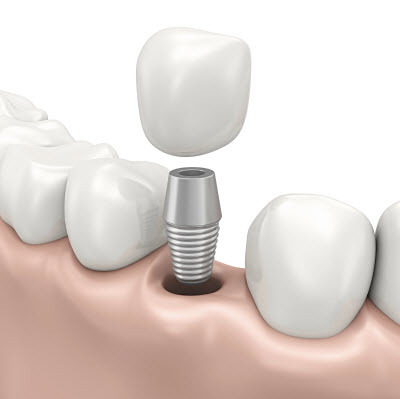 Dental implant restorations are the visible teeth that the implant posts support. Once your healing period is complete, Dr. Durando adds this prosthetic tooth to complete the form and function of your smile. The restoration can be made from porcelain, zirconia, or layered porcelain-zirconia combinations. All these materials are all hardy ceramics that mimic the color and brilliance of natural teeth. Menlo Park Family Dentistry provides dental implants to anyone in need of a renewed smile. For more information about the benefits of implants, call our office and schedule an appointment today!